King says he'll need the money to defend him against advertising campaigns this fall since his opponents wouldn't agree to forgo Super PAC money. 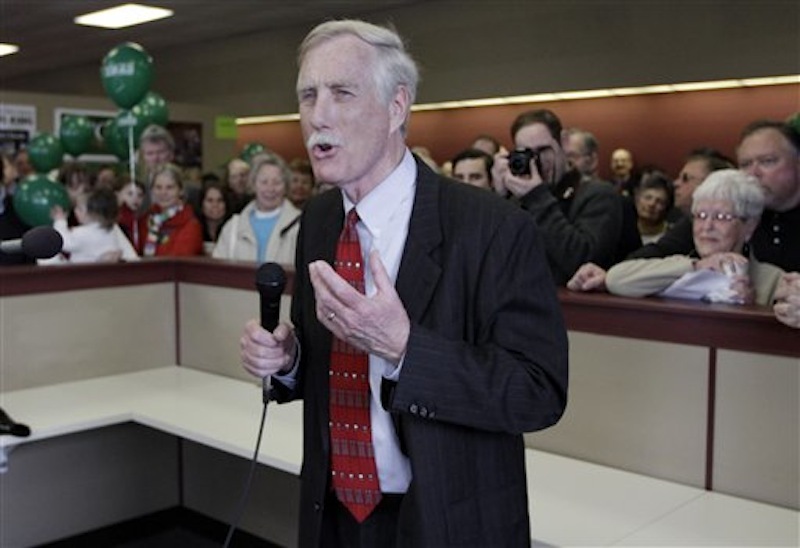 Angus King’s rivals in Maine’s U.S. Senate race criticized the independent frontrunner Wednesday for traveling to Washington, D.C. to raise money from big-name donors and lobbyists. King defended the fundraiser, saying he is just getting prepared to defend himself from partisan advertising campaigns this fall. But Republicans and Democrats said the trip proves that King is not what he advertises: a non-partisan reform candidate who won’t owe any favors except to Maine voters. Maine Sen. Cynthia Dill, the Democratic nominee, said King’s claims to be an independent outsider are disingenuous. The criticism may sound familiar to King. When he ran for governor in 1994, King criticized his opponents for cozying up to special interests by accepting money from PACs, or political action committees. King issued a written statement Wednesday saying he has to be financially prepared to take on partisan special-interest groups. That’s a reference to Republican super PACs that could spend millions on anti-King ads, especially if Summers is able to chip away at King’s lead in the polls. Washington D.C. lobbyists and longtime Democratic supporters Tony and Heather Podesta co-hosted the Capitol Hill fundraiser for King. The invitation asks attendees to donate $500, $1,000 or $2,500. The Podestas are well-known power-brokers in Washington, and each leads a lobbying firm that represents businesses, industries and other clients – even foreign countries – that want to shape federal laws and policies. Tony’s brother John Podesta was Pres. Clinton’s Chief of Staff and a member of Pres. Obama’s transition team. They also are prolific bundlers, the term used to describe wealthy, well-connected donors who gather individual campaign donations from friends and associates so they can give more than the individual maximums. Other hosts were Izzy Klein, a former aide to New York Sen. Chuck Schumer who now works at the Podesta Group, and Nancy Jacobson, a Democratic fundraiser who helped form the nonpartisan group No Labels. The nonprofit organization Council for a Livable World is named as a sponsor on the invitation as well. King attended a similar Washington, D.C., fundraiser last month. Charlie Webster, the chairman of the Maine Republican Party, issued a statement calling King’s fundraising trip to D.C. “the height of hypocrisy.” He noted that the hosts of the benefit are lobbyists for such special interests as the oil and pharmaceutical industries, as well as being Democratic fundraisers. Republicans have said King will hand the Senate majority to Democrats if he has the chance. “It’s increasingly clear that ‘independent’ Angus King isn’t so independent after all,” Webster said in the release. King has maintained that he won’t decide until after the election, if he wins, which party — if any — he will caucus with. He said Wednesday he remains independent and isn’t making any promises to donors. King also said Wednesday he has no choice but to accept PAC donations. He rejected such money when running as a candidate for governor, saying PACs were explicitly “set up to influence government through money.” As a Senate candidate, however, he has accepted more than $63,000 from PACs, including the American Association for Justice PAC, Engineers Political Education Committee, the American Health Care Association PAC and Google netPAC. King’s main rivals have received some PAC money, as well, although not as much as King. King is the only candidate in the Senate race to so far get help from a so-called super PAC, a committee that spends independently on a candidate’s behalf rather than donating to the campaign directly and being subject to disclosure rules and contribution limits. A super PAC called IcPurple spent more than $23,000 as of last month to produce television and online ads supporting King. The former governor has said he would discourage all super PAC support if the other candidates do the same. Dill said she is willing to discuss such a deal but wanted more details, while Republican Charlie Summers dismissed it as a gimmick. King said Wednesday that he ran for governor before the Supreme Court opened the door to unlimited, anonymous donations through super PACs. Anthony Corrado, a professor of government at Colby College and an expert in campaign finance, said King may be right about what lies ahead. Republican Super PACs are now spending millions of dollars in some states to influence close races, and they are closely watching the Maine Senate race for signs that King can be defeated. King’s $900,000 in campaign contributions as of June 30 – more than three times what anyone else had raised – is not nearly enough, Corrado said. Sen. Susan Collins, R-Maine, and her challenger, former Rep. Tom Allen, spent a combined $14 million in Maine’s last senate race in 2008, he said. “(King) is far from having raised the amount of money it takes for a major Senate campaign and certainly far from the amount that’s needed to defend against significant spending from outside the state if it decides to come into the race,” Corrago said.